On 30 January, the Church celebrates the memory of the three great hierarchs: Basil the Great, Gregory the Theologian and John Chrysostom. This is not a commemoration in the strict sense of the word, i.e. 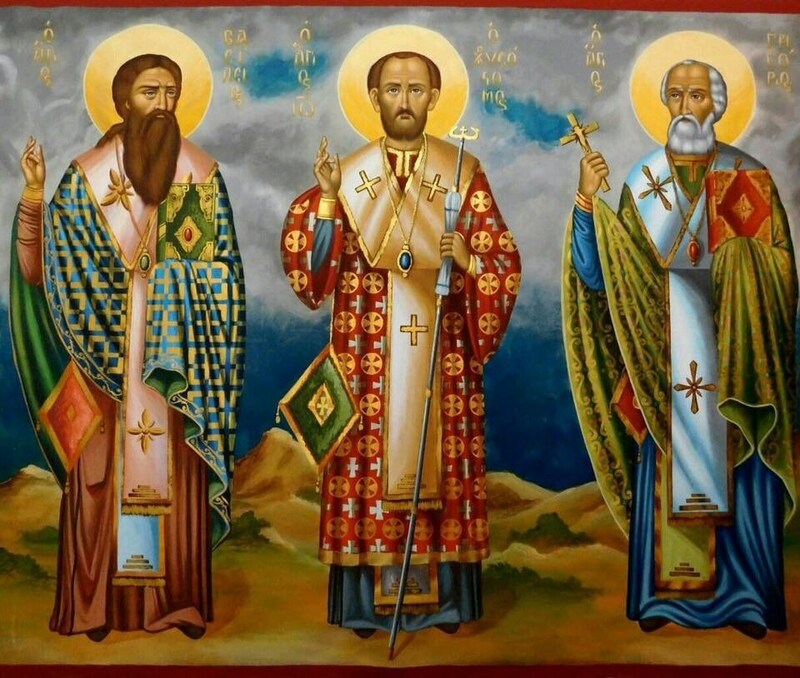 the anniversary of the death of these Fathers, but a common feast, a “synaxis”, to use liturgical terminology. Basil the Great died on 1 January in the year 379 and his memory is celebrated, as is well-known, on January 1; Gregory the Theologian departed this life on 25 January, 389, so his feast is just past; and John Chrysostom fell asleep in the Lord on 14 September 407, on the day of the Elevation of the Honorable Cross. The latter’s commemoration has been moved, however, because it coincided with one of the Lord’s feasts, and it is now held on 13 November. The feast on 30 January is of later provenance, which is why it is not to be found in the most ancient calendars of feasts. It was established in the 11th century, during the reign of Alexios Komninos (1081-1118). The reason for the common feast for all three is related at length in the synaxarion (calendar of saints) for the day. There was a clash between the “learned and virtuous men” in Constantinople. Some considered Chrysostom the most important of the three hierarchs, other Basil and others again Gregory, each group belittling the other two. So three conflicting parties were formed: the Johannites, the Basilites and the Gregorites. The discord was ended by John Mauropous, the Metropolitan of Euchaita (today’s Avkat), a devout cleric and scholar. According to the author of the synaxarion, he saw the three saints in a vision: first each one separately and then the three together. With one voice they told him: “We three are one, as you see, close to God and nothing can separate us or make us contend… There is no first or second among us… Arise, therefore, and tell those who are quarreling not to divined into parties over us. Because in life and death we had no desire other than to bring peace and unity to everyone”. As a symbol and expression of their unity, they urged him to establish a common feast for all three. So the Metropolitan of Euchaita undertook the task of reconciling the conflicting groups and established the feast on 30 January. He judged January to be the most suitable month for their common commemoration, because all three celebrate in that month: January 1, Basil; 25, Gregory; and 27, the translation of the relics of Chrysostom. The establishment of the feast served its purpose. It became the visible symbol of the equality and unity of the great teachers and of the reconciliation of the three estranged parties. Metropolitan John composed a common service for all three, worthy of their status as great Fathers. Since then, the three are often depicted in the same icon, clad in their episcopal vestments, with a Gospel in one hand and blessing with the other, as if they were together not only in spirit but in the body. And they are, indeed, the eternal and immortal teachers of the Church of Christ. They taught with their holy lives, their exceptional activity and their wise writings. In them, the Christian ideal of the “image and likeness of God” was embodied in the form of people shaped and reborn in Christ. And, above all, education, edification and proficiency in Greek philosophy were combined with the truth of Christianity. They were wise in the things of the world and those of God. A more harmonious marriage between Hellenism and Christianity in all their perfection has never been presented to the world. This is why their feast has become one of Christian, Greek education, of which the three hierarchs were teachers and models. We also encounter the three hierarchs in another iconographical representation: in the large depiction of the Second Coming of the Lord which was painted by Byzantine artists in the narthex of a church, above and around the central entrance. 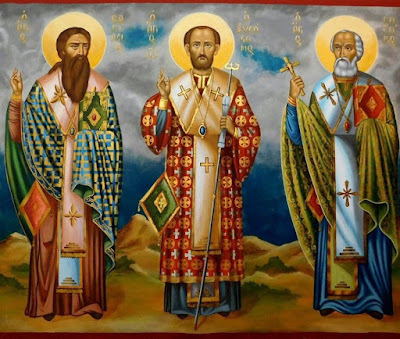 In the group of the saved who are entering God’s Paradise, it is easy to pick out three venerable figures presented exactly as the iconographic tradition of the Church has preserved them and as they are described in the synaxarion of their feast. This is the meaning and the aim of the honor paid to the saints in our Church. To show the unceasing and unbreakable communion of the members of the Church. A communion of those living believers in Christ, either here on earth or in the state of bliss in heaven. A society for which there are no dead, only the alive, since all who are its members have, through the sacraments, been united to Christ, the eternal and immortal giver of life. All together hymn and glorify God; the living pray for the departed, the departed for the living. All are citizens of the Kingdom, with the seal of immortality, with their names written in the book of life. The service for the three hierarchs is attributed to the author of the synaxarion of the feast, Metropolitan John Mauropous of Euchaita who “gave the Church this feast to celebrate to God” and wrote canons, hymns and encomia for it. The hymns at the lity at Vespers and the verses of the aposticha are attributed to Neilos Xanthopoulos and the hymn at the “Both now” at the aposticha is a poem by Patriarch Germanos of Constantinople. The three canons are expressly attributed to John. Some of the most characteristic hymns of the feast are: “The organs of grace” (first sticheron of Vespers, tone four, in the manner of “Bold in martyrs”; “Rejoice, trinity of Hierarchs” (the first of the aposticha in plagal of the first tone), in the manner of “Rejoice ascetics’”; “With what crowns of praise shall we crown the teachers…” (the first sticheron of the Praises in tone two, in the manner of “With what crowns of praise”; and the doxastikon of the stichera in plagial of the first tone, “Let us sound the trumpet…”. Source: Λογική Λατρεία [Rational Worship], Publication of Apostoliki Diakonia, pp. 380-88.